Mahara Magistrate Dharshika Wimalasiri ordered former DIG Vass Gunawardena who had allegedly extorted Rs. 1.5 million from Singappuru Sarath – a suspect turned State witness in the Kelaniya Pradeshiya Sabha member Hasitha Madawala murder case, be remanded. The Criminal Investigation Department (CID) produced the former DIG before the Mahara Magistrate following a complaint by Sarath Kumara Edirisinhe alias Singappuru Sarath who was a former secretary to Minister Mervyn Silva. The former DIG is alleged to have threatened to kill Singappuru Sarath unless three million rupees was paid to him and had obtained half that sum. CID special investigation unit Inspector Ranjith Munasinghe tendering the investigation report informed court that the CID had obtained bank account details of the former DIG. 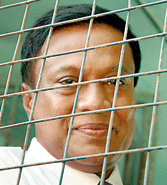 Inspector Munasinghe requested court permission to record a statement of the former DIG with regard to his bank transactions by visiting him at the remand prison. He also requested the court to remand the suspect until investigations are concluded. Senior Counsel Ajith Pathirana appearing for Vass Gunawardena accused the CID of malicious attempts to implicate his client in various other cases as it lacked evidence to implicate him in the killing of businessman Shyam. “We do not know what the allegation is in the ‘B’ report of this case,” Counsel Pathirana told court. “Everybody knows who Singappuru Sarath is,” he said. Counsel Pathirana told court that Police officers who arrested Singappuru Sarath received various gratifications from him. There is a strong possibility these CID officers too could have been rewarded by Singappuru Sarath, he alleged. The ‘B’ report was based on some unverified statements of a third party which alleged the former DIG had threatened to kill Singappuru Sarath if he failed to pay three million rupees, Counsel Pathirana pointed out. The ‘B’ report also said that his client had obtained a cheque for three hundred thousand rupees, he said. All these allegations are only hear-say and could not be acted upon, Counsel Pathirana said. The CID is going to file some other cases against his client in the near future, counsel told court. The CID officers are not getting any gratification from anybody and the counsel’s remarks are disgraceful, Inspector Munasinghe told court. He also told court he was not aware of any other cases that are to be filed against the former DIG. Counsel requested court to provide special security to his client as a large number of suspects arrested by him were brought to the court. Having considered the submissions, the Magistrate directed the prison officials to allow the CID to record a statement from the suspect. She also ordered the prison officials to provide adequate security to the suspect and directed the CID to expedite the investigations and report the findings to court.